Polished cast mirror glass and drawn window glass were the most common types of glass used in houses in the 1940s and early 1950s, until the rise of double glazing. Production of double glazing started in Belgium. The combined annual output of all industrial glass manufacturers in Belgium amounted to between 80 and 100 million m² of glass. The British glass manufacturer Pilkington developed a new production process to create glass with a smooth and uniform surface, called float glass. The first example of double vitrage in an apartment building in Brussels was published in the architectural press. 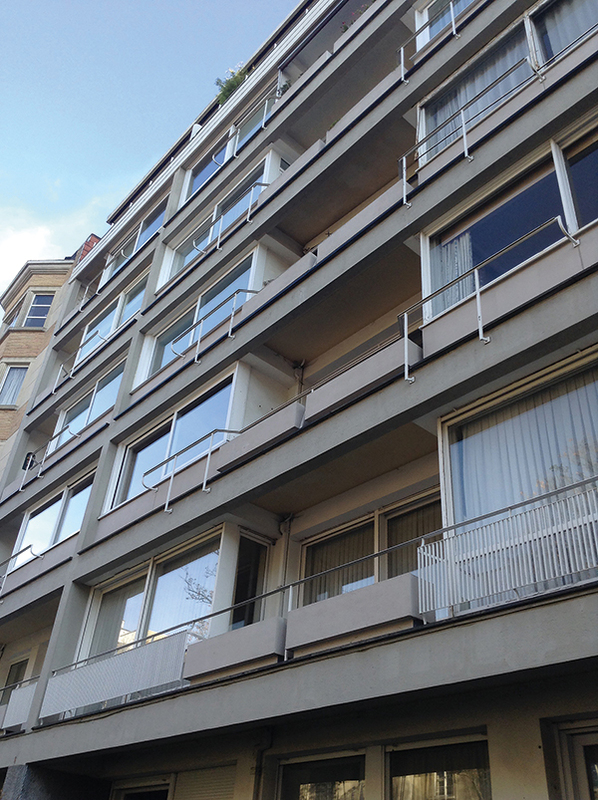 The first example of Thermopane double glazing in an apartment building in Brussels was published in the architectural press. ‘La Maison’ and ‘Architecture’ published a themed issue on glass and glazing. Glaver installed the one millionth square meter of Thermopane glazing. Glaver and Univerbel merged into Glaverbel. The BBRI published a technical note on the terminology for different types of glass and glazing. Glaverbel started to produce float glass. Glaceries de la Sambre was taken over by Glaceries de Saint-Roch. Glaverbel launched Thermopane prêt à placer. Glaverbel advertised the application of Thermopane glazing in renovations. From the 1970s onwards, strips of aluminium were used to maintain the space between the two panes of glass in double glazing. The production of window glass in Belgium started in 1836 in a factory in the valley of the Sambre. From this small start, the number of glass companies increased steadily, while they also became larger, more professional, and better equipped. During the 1950s, the combined annual output of all industrial glass manufacturers in Belgium amounted to between 80 and 100 million m² of glass, which made Belgium one of the world’s important glass manufacturing and exporting countries. The most striking feature of the glass industry in the post-war period, however, was not quantity but its versatility: an increasing range of products became available between 1945 and 1975, from regular window glass and mirror glass, to decorative cast glass, safety glass, coloured glass, insulating glass, etc. The decorative and architectural possibilities were seemingly endless, while the list of extra functions that glass could fulfil became longer and longer (e.g. blocking UV and infrared radiation; providing thermal and acoustical insulation, and greater resistance to breaking). Each of the major companies had its own range of products for all these types of glass, resulting in a multitude of different brands (although often with similar properties) on the market. One of the most popular products that came up during the post-war period and went through a remarkable development was double glazing: still a somewhat expensive feature in the early post-war period, double glazing gradually became a standard, established building material. Glass is made by melting silicate and minerals such as quartz, sand, and crushed flint (over 70% of the mixture), together with potash or sodium oxide, to influence the melting point. The mixture is heated to temperatures between 1200° C and 1500° C and cooled down while, or after, being shaped in the desired form. Although the appearance and forms of glass are quite diverse, most glass products contains the same raw materials, plus a small amount of additives such as magnesium, iron oxide, carbon, lead oxide and sodium sulphate to enhance certain characteristics (e.g. the resistance to breaking and durability, the colour, the absorption of infrared and UV radiation, the transparency, the reflection, and the amount of air bubbles). Recycled glass can also be added, in order to save energy and raw materials. The production of glass is a labour and energy intensive process, and the process can be manipulated in various ways to create different types of glass (e.g. by shaping or forming the glass in different ways, or by means of mechanical treatment). The historical methods to produce glass (blowing and casting glass) have evolved and continued to be used to create special types of glass. In addition, they were supplemented by new methods to produce drawn glass and float glass. In the beginning of the 20th century, the Belgian engineer Émile Fourcault invented a new way to produce glass with machinery. Fourcault proposed drawing a melted glass mixture through a débiteuse (a device with a slot in the middle through which the glass was pulled upward), to create a long, vertical ribbon of glass. While being pulled upwards, the ribbon cooled and was finally cut into flat pieces or sheets of glass. Drawn sheet glass could have a wavy or striped surface, or fine bubbles trapped in the sheet. During the 1950s, the British glass manufacturer Sir Alastair Pilkington developed a new production process to create a smooth and uniform surface. In the Pilkington, or float glass, process, melted glass was poured onto a bath of melted metal, usually tin. The glass flowed on the bath of tin and was flattened by its own weight, creating a very flat sheet with a uniform thickness, perfectly smooth on both sides. The temperature of the bath gradually decreased along the bath, from 1100° C to 600° C, and at the end the glass sheet was lifted onto rollers. After being cooled down further, the sheet was cut into pieces. The thickness of the glass depended on the flow speed of the melted glass and the speed of the rollers. Both the draw and the float processes were commonly used in the post-war period to produce transparent glass for windows. Although traditional drawn glass was of a lower quality than float glass, it was still produced after the large-scale spread of float glass began in 1960. One can easily distinguish between examples of glass made by these processes: glass that was made by hand or by early machine processes like the draw process inevitably showed imperfections and striations (which, of course, also adds to the historic character of the architecture), while modern glass from the 1960s onwards had no or few distortions. The share of glass made by the float process grew, so that at the end of the 20th century, 90% of the flat glass used throughout the world was float glass. Not only the production process, but also the treatment of glass underwent some important changes over the years. Depending on the production process, glass needed to be grinded (to make it perfectly flat) and polished (to make it transparent). While this treatment used to be executed manually, during the first half of the 20th century a transition was made to mechanical treatment. In the early days, the treatment was carried out on one side at a time, but during the post-war period, machines were developed to polish both sides of the glass panes at once. In addition to (regular) blown, cast, drawn, and float glass, many other types of glass have been developed, based on particular production techniques or combing sheets of glass with another material. Examples include double glazing, insulating glass, safety glass, coloured and opaque glass, and cast figured glass. 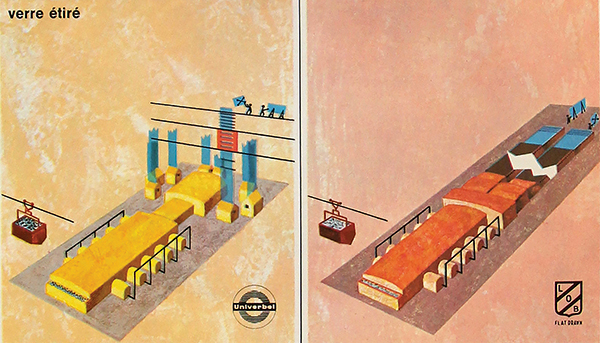 In order to categorize these different products, the Belgian Building Research Institute (BBRI) set up a working group ‘Glass and mirror glass’ in the early 1960s. The working group prepared Technical Information Note 25, on the ‘Terminology of the main glass products used in the building industry’. It defined eight main categories: mirror glass, window glass, cast glass, blown glass, glass blocks, special types of sheet glass, processed glass, and glass treatments. Each category included a number of sub-categories. For example, coloured glass, opaque glass, and athermic glass were special types of sheet glass; safety glass and insulating glass were examples of processed glass. Not every type of glass was commonly used in residential buildings, for instance blown glass and certain types of cast glass like ‘cathedral glass’. Flat sheets of polished cast mirror glass and drawn window glass were the most common types of glass used in house building, until the rise of double glazing in the post-war period. Contrary to what the terminology implies, both are transparent (although rough mirror glass and grounded mirror glass are translucent). The difference between them is that window glass is polished by fire, while mirror glass is polished mechanically. Mirror glass existed in thicknesses between 2 and 40 mm (commonly between 3.5 and 8 mm), while the thickness of window glass could vary between 0.6 and 20 mm. The maximum length and width of sheets was related to the thickness (for instance, the maximum width of an 8 mm sheet of mirror glass was 3.30 m), and transportation or placement possibilities. Theoretically, lengths up to 6 m were possible, yet difficult to achieve in practice. Cast glass was still in use in the post-war period for particular decorative applications. By casting molten glass paste onto a table with a rough or textured surface, the resulting glass was imprinted with a pattern in relief. Because of the imprint, this cast glass – called patterned glass or figured glass – lost transparency but remained translucent and still transmitted almost as much light as transparent glass. Another way to get the relief printing was by pressing the glass between two rollers onto which a pattern had been imprinted. A large variety of patterns or figures were used, from hammered, crenated, and ribbed to custom designs. Glass was also made in shapes other than flat, for example in corrugated sheets and blocks. Glass blocks were produced in various shapes (mostly square or round), sizes (e.g. square blocks from 5 by 5 cm to 30 by 30 cm), colours and types (solid or hollow). Manufacturers claimed these blocks were fire resistant and easy to clean. As for the thermal properties, their insulating capacity was two or three times that of sheet glass, while still transmitting approximately 80% of the light. The combination of glass blocks and in situ concrete (called translucent concrete) was still very popular in the post-war period. Belgian firms such as V. Ackermans, Wenmaekers & Cie, Aug. Nyssens & Cie, Alfred Lenfranc, and many others carried out this technique. By mixing specific ingredients into glass during the manufacturing process, special types of mirror glass, window glass, or cast glass could be created, e.g. coloured glass, opaque glass, opalescent glass, athermic glass, and (anti-)actinic glass (blocking or transmitting UV radiation). For instance, metal oxides could be added in small or large quantities to create coloured glass, translucent or opaque glass. Athermic glass was sheet glass of which the chemical composition was adjusted to absorb sunrays. Athermic glass, which had a very light and soft blue, green or grey tint, was especially popular for glazing in office buildings, libraries, and working spaces. Three main types of processed glass can be distinguished: safety glass, double glazing, and insulation glass. Production of safety glass began at the beginning of the 20th century when multiple sheets of glass were combined using a celluloid foil, pvb-film or resin, to create laminated safety glass. Although this involved two panes of glass, multi-layered and laminated glass are not double glazing – this term applies only to two (or more) panes of glass with a layer of dry air or gas between them. Tempered glass, invented in 1929 by the French glass company Saint-Gobain, was a specific type of safety glass. It was made by heating a sheet of glass up to 600° C and cooling it down very quickly, which made the glass up to five times more resistant to thermal and mechanical shocks, pressure, bending, torsion, and buckling. Tempered glass was thus not easy to break, and when it broke, it did so in innumerable, very little pieces with no sharp edges. Double glazing was one of the most common glass products used in housing construction in the post-war period. It was first commercially produced by the Libbey-Owens-Ford glass company in the early 1940s, under the brand name Thermopane. In Belgium, the first double glazing was produced in 1947; from the 1950s onwards it became commonly available. Double glazing became very popular because of its insulation capacities, both thermal and acoustic. It reduced heat loss by 50% over single glazing, and because of the two-stage transition from cold to warm, prevented condensation. Double glazing also enhanced the acoustic properties of windows: while single glass retained 20 decibels, double glazing stopped 40 decibels. As for the composition of double glazing, the glass panes were usually between 3 and 10 mm thick, while the layer of air could be almost 20 mm. The theoretically largest size for double glazing in the 1960s was 6 m by 3 m. The separation between the two panes initially was assured by a lead or copper band and soldering. From the 1970s onwards, strips of aluminium were used to maintain the space between the two panes. Double glazing needed to be absolutely airtight: moisture between the panes condensed and made the windows translucent instead of transparent. There was no way to repair double glazing once condensation had formed between the panes, other than replacing it. Within the category of double glazing, new technologies and high performance glazing germinated in the post-war period. For instance, already in the mid-1950s, it was possible to use tempered glass instead of ordinary window glass, mirror glass, or cast glass for Thermopane glazing. Three, or even four or five, panes of glass were used by Glaver to create triple, quadruple and quintuple glazing (from the early 1950s, the second half of the 1950s, and the late 1950s onwards respectively). Insulating glass, which also enhances the thermal insulating capacities, included a layer of glass fibres between two panes of glass, hermetically sealed at the edges. However, the fibre layer made the glass translucent instead of transparent. The last category in the BBRI’s Technical Information Note consisted of various ways to treat glass, either industrially or by craftsmen. For instance, by applying a very thin coat of metal to one side of the glass infrared rays were reflected. Other examples were non-reflecting glass, glass that conducted electricity, engraved glass, frosted glass, and enamelled glass. The latter was a specific type of opaque glass: a layer of coloured enamel was applied to the glass and thermally treated to assure a complete vitrification. This glass resisted mechanical and thermal shocks, and atmospheric agents, very well; and needed little maintenance. For these reasons, it was ideal for sandwich panels in curtain walls or parapets. And as it enabled lively colour schemes, enamelled glass fitted perfectly with the optimistic, modernistic architectural style of the 1950s. Throughout history, Belgium has been an important manufacturer of glass. Glass factories were first established in Belgium around the middle of the 19th century, after which many (small) factories followed. During the early 20th century, the need for a mechanized and rationalized industry, together with the difficult economic climate, led to a reorganization of the sector. Some important mergers in the early 1930s led to three main companies, which were still leading companies in the 1950s, namely Univerbel, Glaver, and Glaceries de la Sambre. 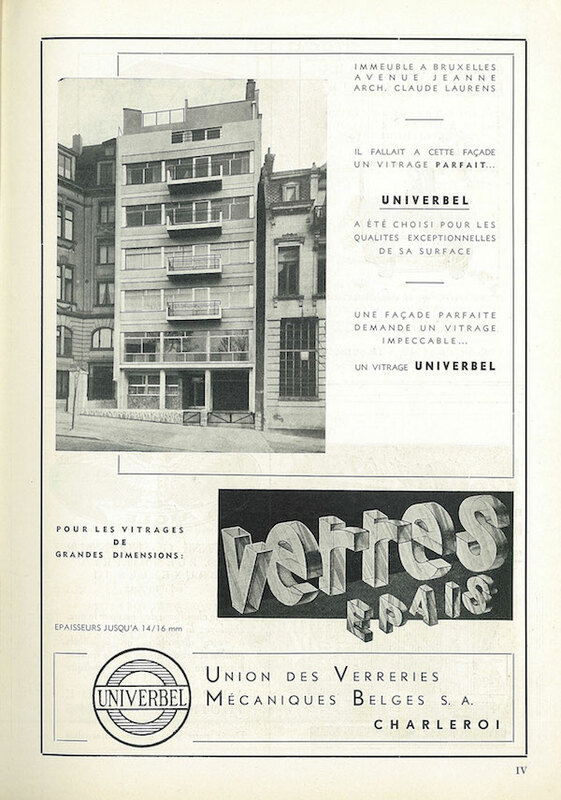 Univerbel was created in 1930 out of the union of 14 small glass factories in Belgium – hence the full name ‘Union des verreries mécaniques belges’. In the post-war period, the company had its headquarters in Charleroi and factories in Zeebrugge, Gilly, and Lodelinsart. Among the most important types of glass produced by Univerbel were drawn glass Univerbel, enamelled glass Colorbel, and double glazing Polyverbel. 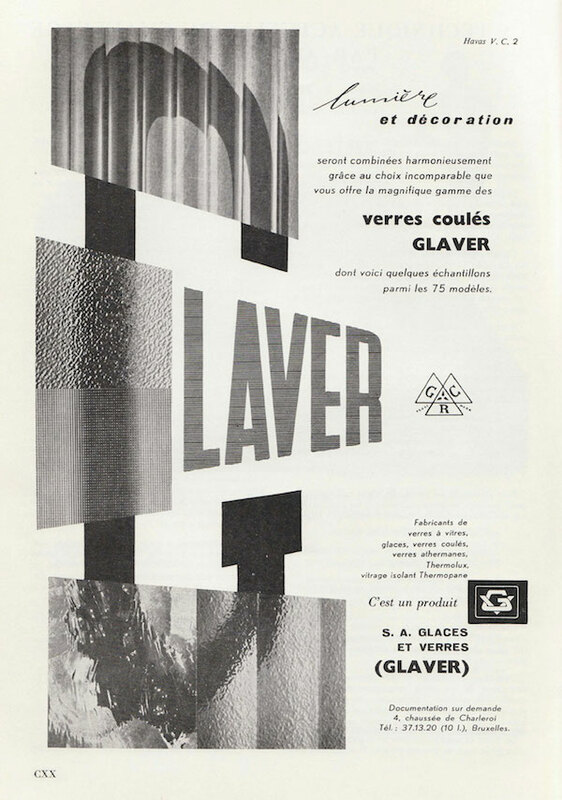 One of Univerbel’s direct competitors was Glaver, the Société anonyme nouvelle Glaces et Verres. Glaver was created in 1931, also by merging several companies. Glaver became one of the major glass manufacturers in the world, with an annual production of almost 200,000 tons in the early post-war period. The company had four factories in Belgium: in Mol, Houdeng, Roux, and Poustier. Glaver produced almost every type of glass, including window glass L.O.B., double glazing Thermopane, insulating glass Thermolux, cast glass G.C.R., coloured glass, and Marmorite glass. The third important company was Glaceries de la Sambre, created in 1932 also out of a merger. 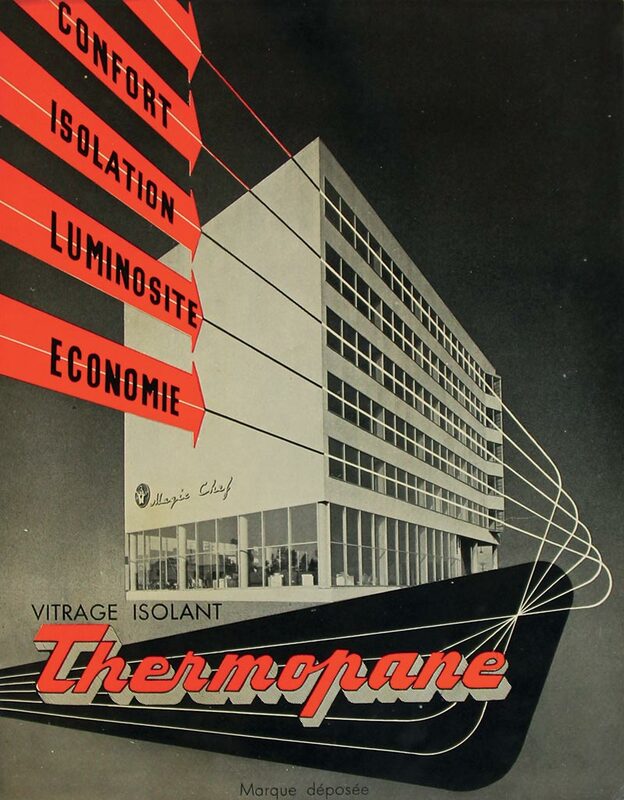 In the post-war period the company was mainly known for its production of double glazing Polyglass, solar glass Filtrasol, two-sided polished glass Duplex, and tempered, enamelled glass Panoroc. 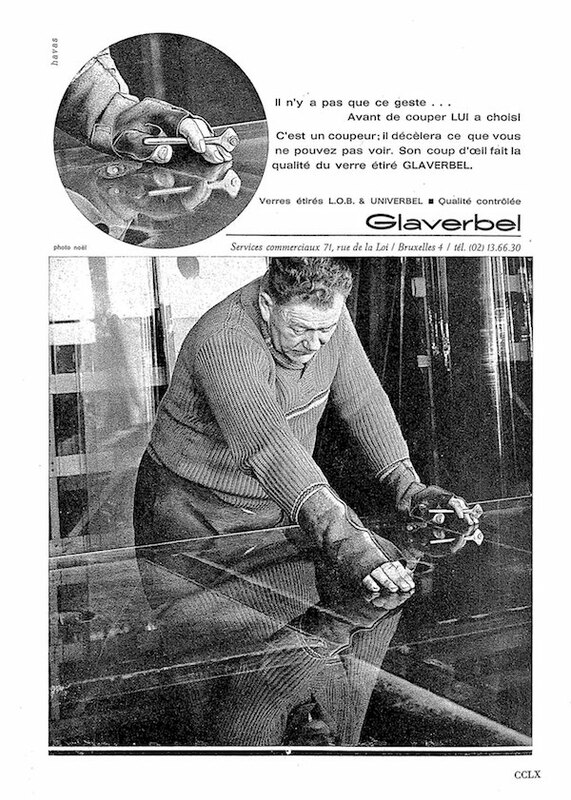 During the post-war period, more precisely in the 1960s, a second important reorganization of the glass industry was necessary: responding to the new scale of the post-war industry and economy, Glaver and Univerbel merged into Glaverbel in 1961, while Glaceries de la Sambre was taken over by Glaceries de Saint-Roch in 1966, without changing much in the product range. The size of the new Glaverbel company raised the market position of Belgian flat glass sheets even more. 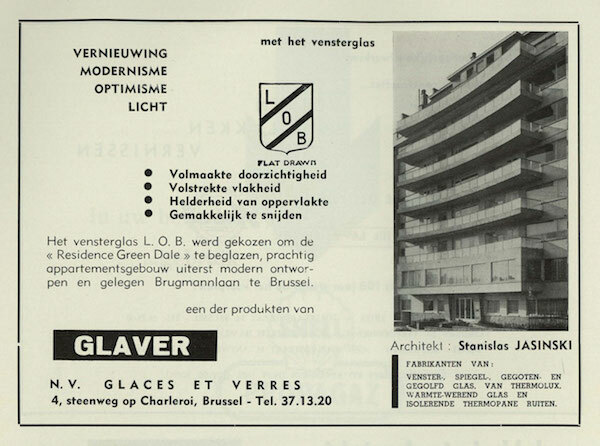 At the end of the 1960s, Glaverbel employed over 10,000 employers and had annual sales of 5.5 billion old Belgian francs; the company produced 80 million square meters of glass each year, of which 75% was exported. The new company produced a full range of the glass products used in the building industry: drawn window glass, polished mirror glass, cast glass, enamelled glass, solar glass, insulating glass, etc. Before the merger, Glaver and Univerbel both produced most types of glass, so choices had to be made in the reorganization. 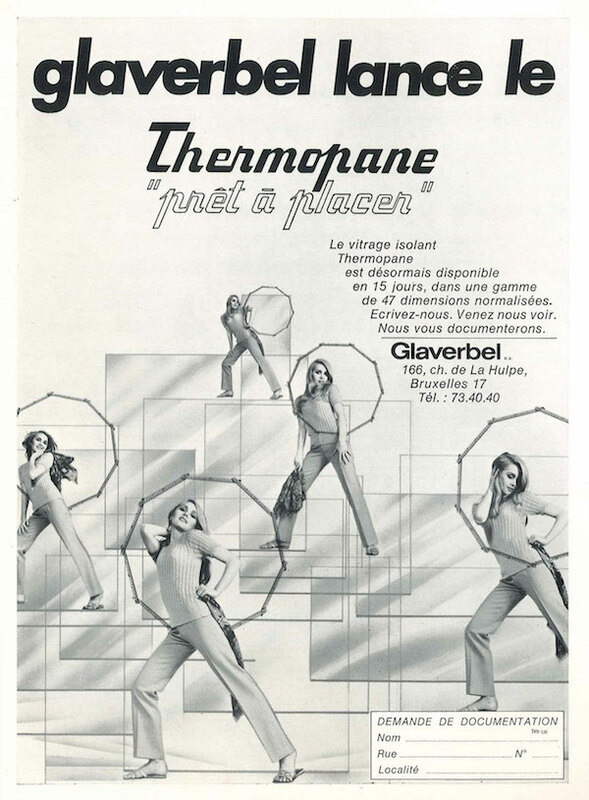 The new Glaverbel range consisted of, among other things, Thermopane (while the production of Polyverbel was cancelled) and Thermolux; drawn glass (produced according to both the Pittsburgh process and the Libbey-Owens process) and enamelled glass Colorbel. While new production lines were started (for instance, production of float glass was started in 1965), the old, familiar products like Thermopane were further developed and improved. 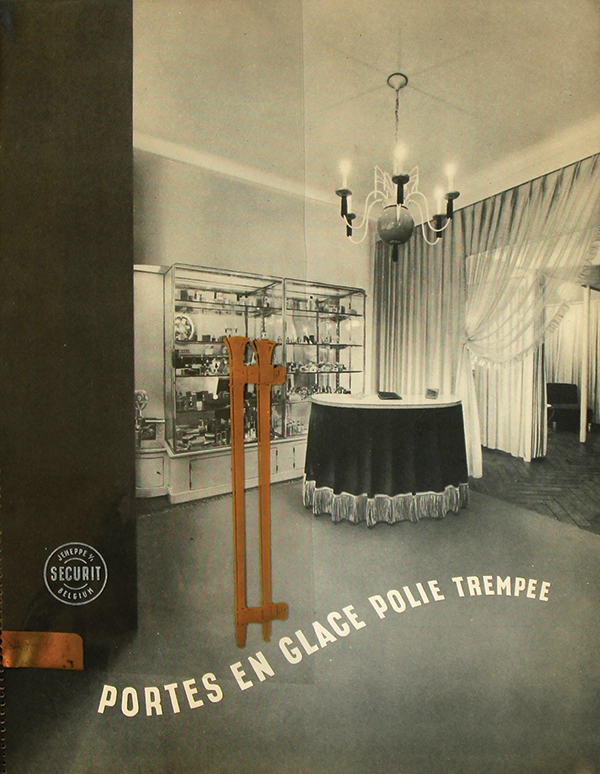 Other important glass manufacturers in the post-war period were Glaceries Réunies and Sobelever. The first was an important producer of safety glass. Sobelever, or the Société Belge d’Exploitations Verrières, sold polished, tempered safety glass B.P.G. for doors, and folded glass plates Profilit Bauglas, among other things. Their most famous product was Pan-O-Glass, an enamelled, tempered safety glass. An examination of contemporary architectural journals and architects’ archives reveals two main types of window glass used in the post-war period: L.O.B. produced by Glaver, and Univerbel produced by Univerbel. The window glass L.O.B. was manufactured using the Libbey-Owens system: after being drawn upwards, the sheet of glass was bent over 90 degrees around a roller before proceeding horizontally through the annealing oven. The 60 m long annealing oven was equipped with burners: polished by fire, the glass was made extra brilliant, completely transparent, perfectly smooth, and easy to cut. Window panes were up to 2.85 m wide and maximum 5 m high. The K-value of window glass L.O.B. was 5.8 to 6.4 W/m²K; the transparency was 92%. Univerbel glass was produced with the Pittsburgh vertical draw system in the factories in Lodelinsart, Gilly, and Zeebrugge. This glass was praised principally for its flatness and complete transparency, which let through a maximum amount of sunlight without distortions. 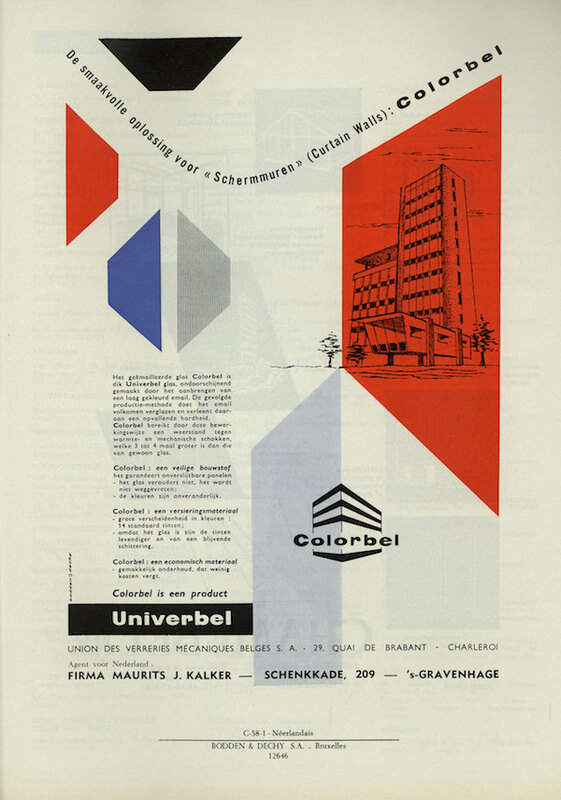 Univerbel also developed several finishing treatments for its drawn glass, e.g. perforating, chamfering, gluing, tempering, curving, acid etching, and sandblasting. The maximum surface of Univerbel glass varied from 183 cm by 80 cm (for a thickness of 2 mm) to 399 cm by 180 cm (possible with Univerbel of 16 mm). Cast glass was produced by Glaver (and later Glaverbel) under the brand name G.C.R. It is a translucent type of glass, yet transmits almost as much light as transparent glass. It was available in ‘white’ (colourless) and in colours (including green, blue, yellow, pink, red, orange, grey, and violet). Cast glass G.C.R. was made in a continuous process, by pressing molten glass between two rollers. A pattern or image was imprinted on one or both rollers, so that the pattern was transferred onto (one or two sides of) the glass. After annealing and cutting, the glass panes could receive an extra treatment, e.g. engraving, sandblasting, or acid etching. G.C.R. was said to be less expensive than transparent glass, and it was insusceptible to ageing or chemical agents. The common thickness of cast glass G.C.R. was 3 to 4 mm. ‘Striped’ and ‘hammered’ were two popular patterns, but new patterns were continuously added to the catalogue, so that during the 1960s, 78 designs were available. Depending on the design, between 66 and 91.5% of the light was transmitted. G.C.R. was used in roof windows and industrial applications (because of its high mechanical quality) as well as in houses (because of its decorative aspect). For specific uses, where extra strength or fire-safety was necessary, a wire mesh could be inserted in the glass. A specific type of opaque glass, dyed in the mass, was Marbrite, produced by Verreries de Fauquez. Marbrite was made with regular glass ingredients, to which kaolin, cryolite, feldspar, and metal oxides were added and heated up to 1400° C. It was very hard and needed to be worked with diamond tools. Available in 17 different colours, Marbrite was used for inside as well as outside applications. Similar to Marbrite was Marmorite, a blurred type of glass that likewise was dyed in the mass and polished mechanically. Its thickness varied between 6 and 35 mm. Marmorite could be used for different purposes, among other things for applications where hygiene was very important, for example in kitchens, restaurants, cafes, hospitals, or schools. Glaver(bel) produced two types of athermic glass: Thermosol and Athermane K60. Thermosol was transparent window glass with a greenish shine, while Athermane K60 was translucent cast glass. The amount of radiation heat that was absorbed or reflected depended on the type and the thickness of the glass. Typical values for Thermosol glass were 20% heat transfer and 70 to 75% light transfer (compared to 90% for regular polished window glass). Because of internal tensions in athermic glass caused by the absorption of radiation, precautions needed to be taken: a free space of 5 to 6 mm between the glass and its frame was required, and the glass needed to be affixed with a product that did not harden or become rigid. Glaceries de la Sambre also produced several types of athermic glass. Filtrasol was athermic cast glass, which absorbed 60 to 80% of infrared rays. It existed in wire and figured glass and had a blue-greenish colour that softened the transmitted light. Filtragrey was the grey version of Filtrasol: because of the grey colour, less light was transmitted, yet it absorbed less infrared radiation. A third variety was Filtrabronze, which blocked much UV radiation. The physical characteristics of the three varieties were similar: they were produced in the same dimensions and thicknesses (starting from 3 mm) and could also be used as safety glass. One of the specialists in the field of safety glass manufacture was Glaceries Réunies. They produced Securit, Clarit, and Glacetex among other things. Securit glass was tempered glass and therefore had high mechanical and structural properties: its bending resistance was 215 to 245 N/mm² (compared to 34 to 39 N/mm² for regular glass) and resisted torsion up to 30 or 40°. It was adapted to high and low temperatures, and large temperature swings, without difficulty. The thicker the panes, the larger the dimensions: an 8 mm thick pane could measure up to 150 cm by 135 cm, while the maximum dimensions of 25 mm thick panes were 243 cm by 275 cm. For doors without a frame, Securit glass with a thickness of 11 to 13 mm was used. Glaceries Réunies developed Clarit specifically for interior doors: it was thick, tempered glass (8 to 10 mm), colourfast and translucent with a dotted pattern. The company also developed a third type of safety glass, Glacetex, to overcome the difficulties of cutting or processing Securit glass on-site. Glacetex was laminated glass made out of two (or more) polished glass panes, between 2.5 and 3.5 mm thick, which were glued together with a plastic foil between them. Glacetex could be flat or curved. If the glass broke, the pieces stuck to the foil. The main advantages of Glacetex were its high resistance to mechanical impact (because of the core, which absorbed the major part of the impact; the glass was said to be bulletproof); a perfect adhesion of the plastic foil; no steel frame around the edges to seal it hermetically; the possibility of cutting it; and a high transparency (up to 90%). 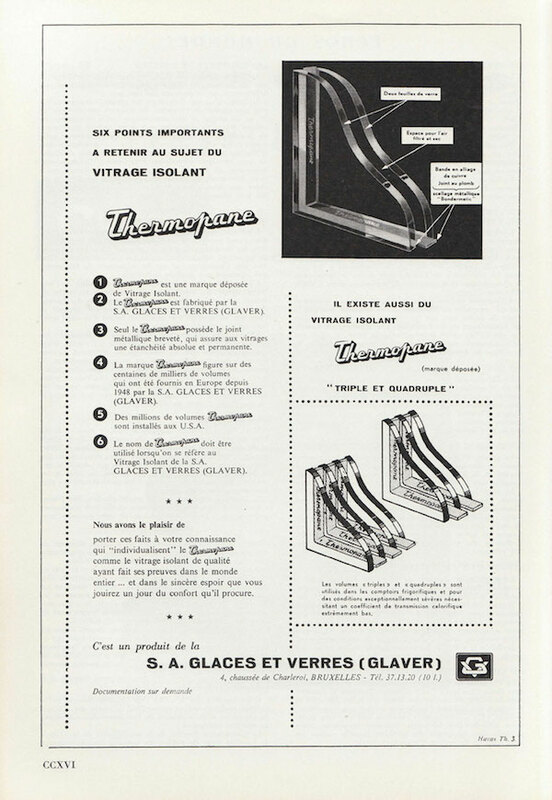 Each of the three major glass manufacturers developed their own brand of double glazing: Glaver had Thermopane, Univerbel produced Polyverbel (up until the merge with Glaver), while Glaceries de la Sambre (and later, Glaceries de Saint-Roch) manufactured Polyglass. For each of the manufacturers, double glazing was a top seller in its product range. Although the thermal performance of the various brands of double glazing was similar (varying between 3.0 and 3.5 W/m²K), the connection and the composition of the glass panes differed. The companies often imprinted their names in the joint between the two glass panes. The brand name Thermopane, registered in 1941 by the American Libbey-Owens-Ford glass company, became almost a generic term for a double-glazed unit worldwide. 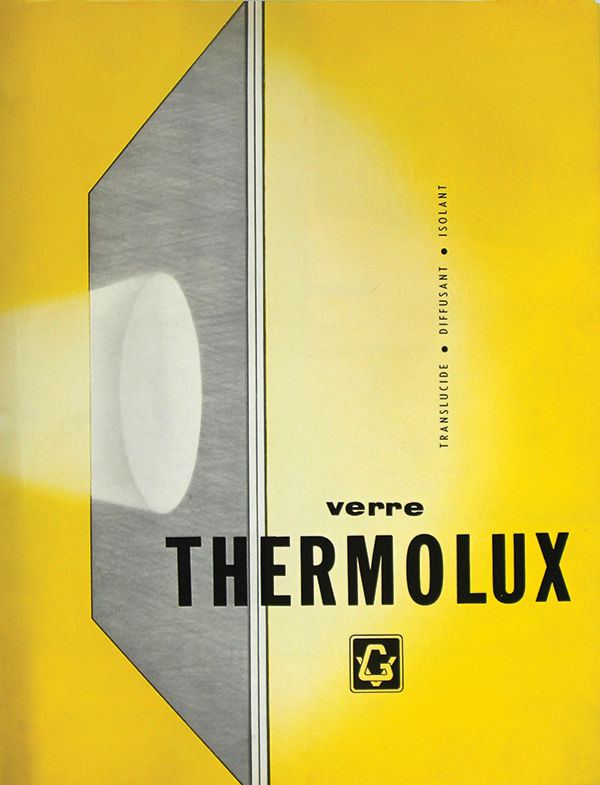 In Belgium, Glaver produced Thermopane from 1948 onwards. Thermopane windows consisted of two glass panes with a layer of dehydrated air between them. The two glass panes were connected with a patented joint ‘Bondermétic’ made of lead and copper: a copper strip was attached to the inside of each glass pane, after which a lead strip was welded between them. Filtered and dehydrated air was inserted in the 6 to 12 mm wide cavity. The airtight joint was flexible and could resist tension. The internal layer of air was between 6 and 12 mm thick. Thermopane window units most commonly had two panes of glass, but the same principle and joint could also be used for units with more panes of glass. Thermopane units up to 6 m² were possible with regular window glass, while polished Thermopane units were made in sizes up to 18m². Thermopane could in fact be produced with almost any kind of glass, including cast glass, mirror glass, athermic glass, sandblasted glass, and tempered glass. When installing Thermopane in window frames, with putty and glazing beads, contact between the glass and the frame needed to be avoided. To convince the building industry of the benefits of Thermopane windows, Glaver conducted an extensive propaganda campaign. One of the main advantages that Glaver emphasized was reduced heat transfer – 50% less than 4 mm single glass. For instance, a Thermopane window with two glass panes of 3 mm and a total thickness of 14 mm had a K-value of 3.5 W/m²K. The size of the window could be increased while heat loss was unchanged; in addition, sharp temperature falls near the windows were avoided, greatly improving the comfort level as well. A sales argument, which seems obvious today but highlights the novelty of double glazing at the time, was that Thermopane windows were easier to clean: only two surfaces needed to be cleaned, compared to four surfaces in ‘double windows’. 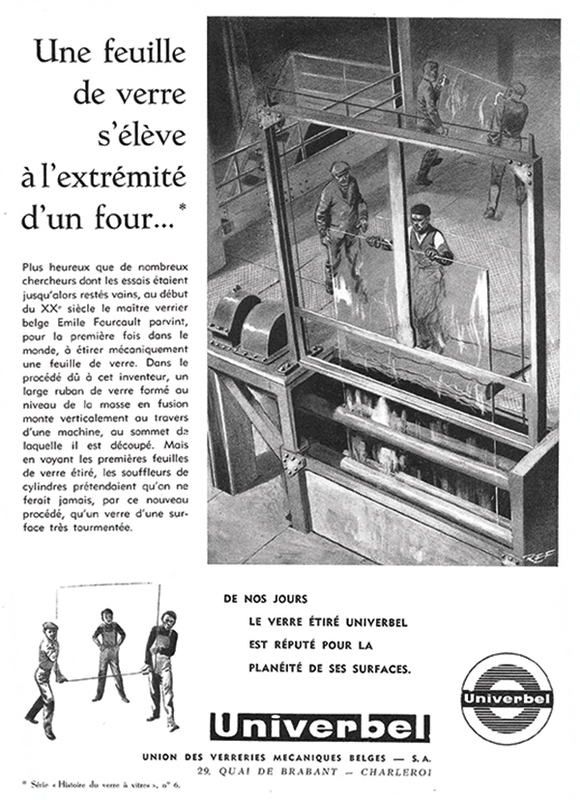 The promotion campaign seems to have succeeded: although the production of Thermopane windows was still relatively limited in the early 1950s (approximately 100,000 Thermopane windows were put in place throughout Europe in 1955), demand for them grew so that in 1960 Glaver could celebrate the installation of the one millionth square meter Thermopane glass (which happened to be in the Telex building in Brussels, designed by architect Léon Stynen). During the 1960s, the technology of Thermopane had improved to a point that Glaverbel raised the period of warranty against diminished visibility, condensation, and dust on the inside from five to ten years. 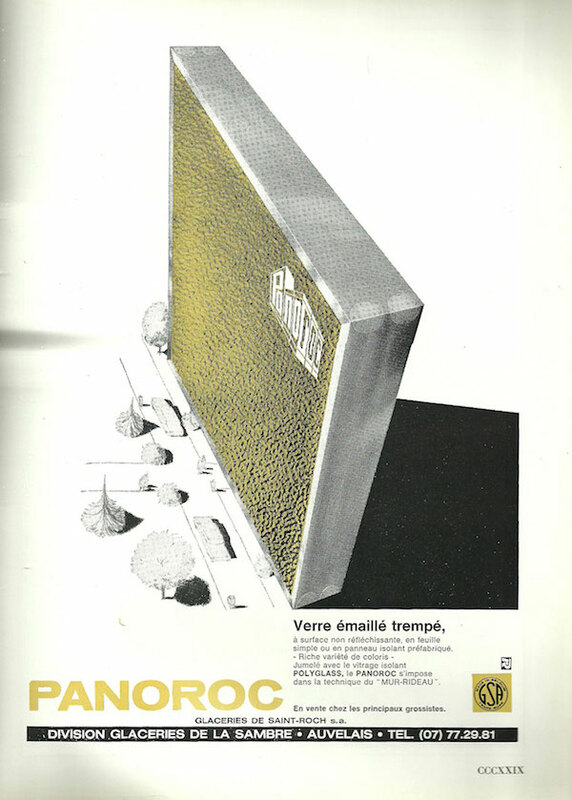 The success of Thermopane increased even more when ‘Thermopane pret à placer’ was put on the market in 1968, in 47 standard dimensions, ready to be delivered on site within two weeks. 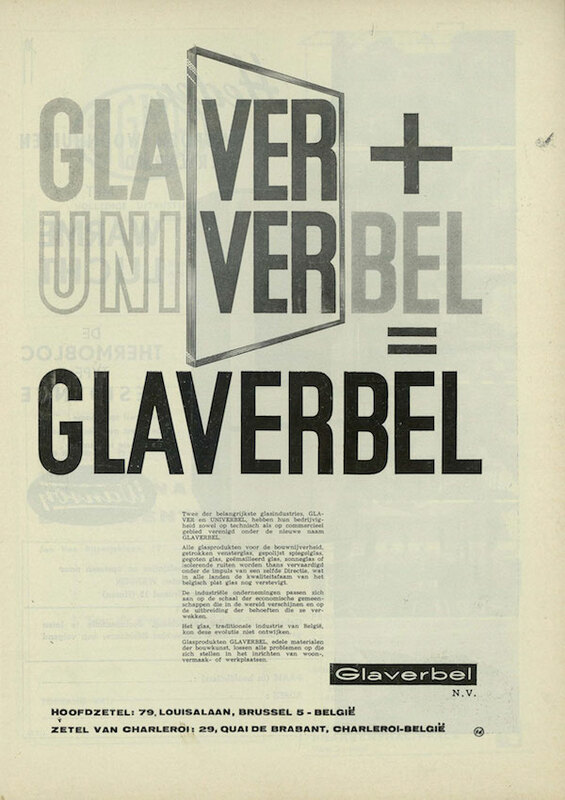 In 1968, Glaverbel also started to promote Thermopane for renovations, emphasizing the fact that existing window frames could be adapted to fit Thermopane glass. Polyverbel was Univerbel’s brand of double glazing: two (or three) panes of drawn window glass Univerbel were enclosed in a rigid frame of stainless steel with a layer of dehydrated air between them, sealed by a wear-proof, hydrophobic, plastic joint. For double glazed Polyverbel window units, panes of 3 to 7 mm could be used (with 6 to 13 mm of air between, resulting in a total thickness between 14 and 27 mm). For triple glazing, the individual glass panes were 4 or 6 mm thick (with 6 mm of air in between, giving 27 or 34 mm in total). To qualify for a five year warranty, Polyverbel had to be correctly placed, i.e. on supporting lead or neoprene blocks, and with lateral distance pieces, to avoid direct contact with the window frame, while a plastic putty created a waterproof connection around the edges. Polyverbel glass transmitted more light, less heat, and less sound than regular glass. Acoustically, it absorbed 40 decibels (compared to 20 decibels for single glazing). Thanks to the K-value of between 3 and 3.5 W/m²K for double glazing Polyverbel (2.1 W/m²K for triple glazing), interior comfort was improved and condensation avoided. As heat losses were reduced by 50%, the glass surface could be increased or heating expenses could be lowered by 20%. It was claimed that the extra cost of double glazing Polyverbel could be recovered in six to seven years. 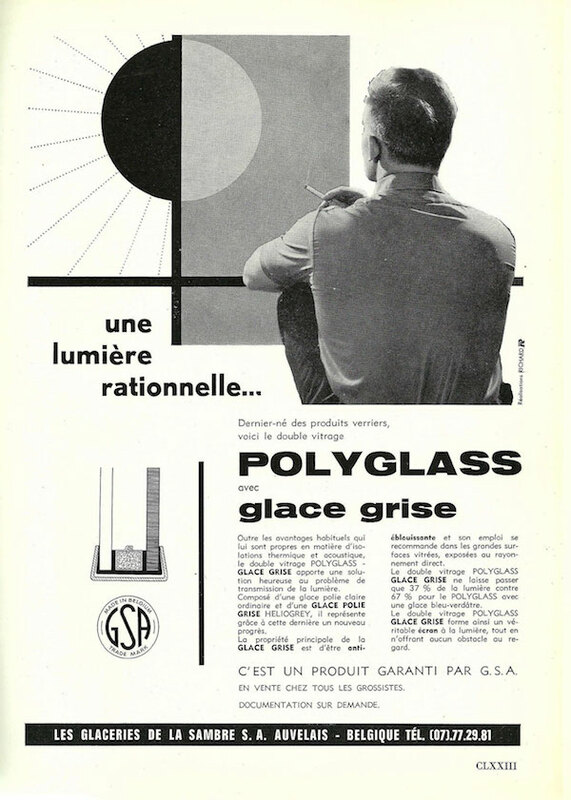 Glaceries de la Sambre did not lag behind its competitors and produced double glazing Polyglass. It was made with two-sided polished mirror glass, perfectly flat and clear, without distortions or stripes. The flexible joint between the two panes was made with a silicone gel and steel holders. This joint hermetically sealed the space between the two panes, which was filled with dehydrated air. The whole was enclosed within a U-shaped profile edge in polyethylene and a stainless steel frame, which made the Polyglass unit robust. The maximum dimensions of the panes were 3 m by 5 m. In 1961, the range of Polyglass consisted of 13 types of double glazing, four types of triple glazing, one type of quadruple glazing, and even one type with five panes of glass (the last two were not used in buildings but, for example, in refrigerators). 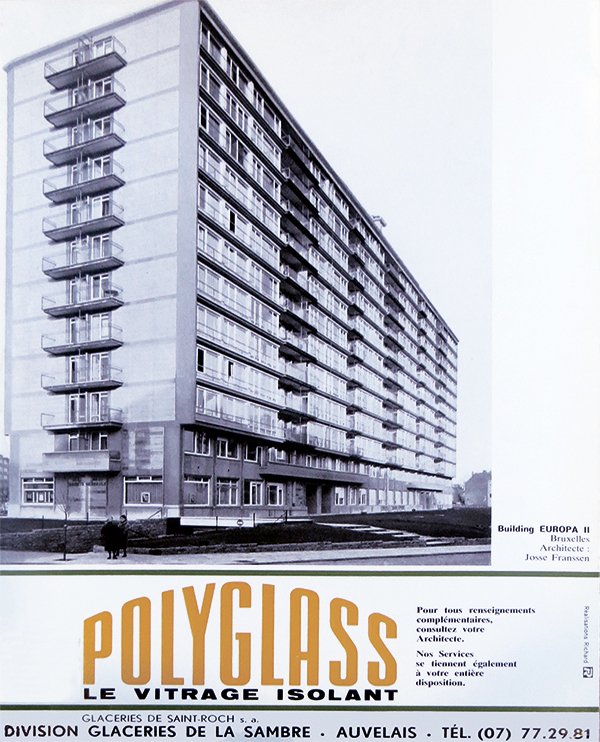 Polyglass came in several varieties, with different types of glass. An example thereof is the façade of the Luxembourg pavilion at the 1958 World’s Fair ‘Expo 58’ in Brussels: the pavilion was clad with 1200 m² of Polyglass double glazing consisting of a regular mirror glass pane on the inside and a blueish mirror glass that absorbed infrared rays on the outside. Other alternatives were Polyver (a double glazing with window glass instead of polished mirror glass), and Polygrey (which combined regular glass with a grey, polished solar glass Filtragrey). The thinnest type of Polyglass was ‘D143’: the ‘D’ stood for double glazing, ‘14’ for the total thickness (in mm), and ‘3’ for the thickness of the two glass panes (also in mm). This type of Polyglass weighed 16 kg/m² net. The heaviest type with two glass panes was D4012, which weighed 61 kg/m². The K-value of Polyglass with two panes of glass varied between 3.1 and 3.4 W/m²K. A third layer of glass decreased the K-value to 2.3 or 2.1 W/m²K. In addition to Thermopane, Glaver produced another type of glass with enhanced thermal properties called Thermolux. It consisted of two layers of glass with a thin layer of glass fibre insulation in between, creating a diffuse, neutral and natural light. Heat losses decreased 40% compared to a single transparent glass, condensation decreased, and sound insulation increased. The mechanical resistance of Thermolux glass was similar to that of wire glass. The two panes of glass could be window glass, polished glass, or cast glass. When a very thin coat of metal or metal oxide was applied on one side of a glass pane, the glass reflected infrared radiation. Glaver applied this technique under the brand name Stopray. The coating could be applied to drawn window glass or polished glass, which was then incorporated in double glazing Thermopane. Stopray glazing blocked as much as 70% of heat from solar radiation entering a building, while reducing heat losses in the winter in amounts comparable to that of a triple Thermopane window. Enamelled glass was particularly suited for making sandwich panels for curtain walls, demand for which rose from the 1950s onwards. Thereupon, various companies developed enamelled glass products. Colorbel was the name of Univerbel’s enamelled glass, which consisted of a relatively thick pane of Univerbel window glass covered with a layer of coloured enamel, which vitrified completely during production, making it very strong and durable. Colorbel could withstand thermal and mechanical shocks three to four times better than ordinary glass; the manufacturer claimed it resisted ageing, erosion, and fading, and was easy to maintain. Colorbel came in 14 colours; panes were 5 to 7 mm thick and came in sizes up to 2.40 m by 1.40 m. Weighing between 11.5 and 17 kg/m², Colorbel needed to be installed in relatively robust frames, with enough room for thermal expansion between the glass and the frame. The glass was supported by small blocks of lead or neoprene to avoid direct contact between the glass and the frame. Putty or sealed glazing beads made the connection waterproof. Glaceries de la Sambre developed Panoroc as their brand of tempered, enamelled glass. 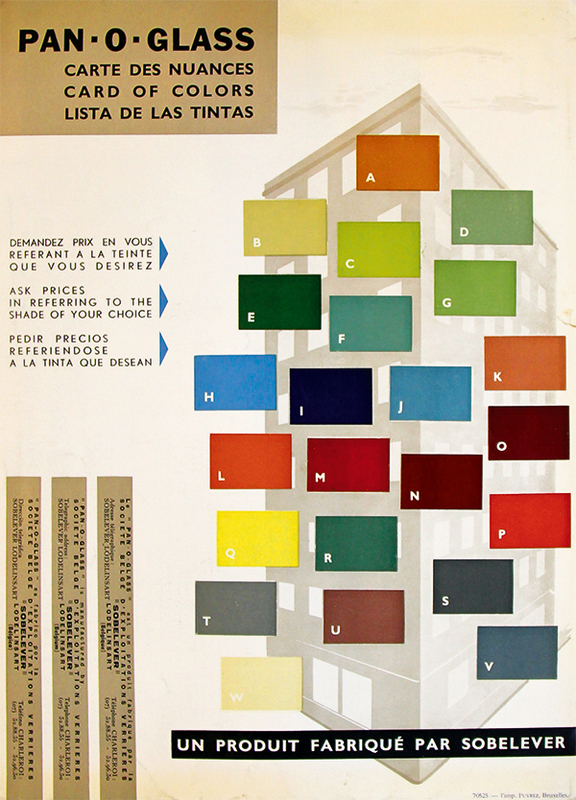 The maximum dimensions of Panoroc were 2.50 m by 1.50 m and it came in 14 colours. It could be used as a simple panel or in sandwich panels (with a core of rock wool). Similar the company’s double glazing Polyglass, Panoroc panes were enclosed in a stainless steel and polyethylene frame. The panels were made in four thicknesses (27, 34, 40, and 47 mm). The K-value was between 1.7 and 0.9 W/m²K, depending on the thickness. Pan-O-Glass was an enamelled type of glass produced by Sobelever. Pan-O-Glass passed ageing and weathering tests, so was suitable for inside (e.g. for interior design and furniture) as well as outside use (curtain walls, furnishings in public spaces). Its main field of application was in curtain walls and sandwich panels, in which a sheet of Pan-O-Glass was attached to cork, a wood fibre-cement panel, or another material. Pan-O-Glass was also successfully launched in America, Canada, Norway, Switzerland, Sweden, Australia, and Italy, whereas the Belgian market was a little bit more reticent until the end of the 1950s. To persuade clients, the Belgian factory in fact offered Pan-O-Glass in 23 colours, whereas in America only eight colours were produced, and 15 in England. Despite the many different types of glass and its omnipresence in post-war architecture, glass was almost absent from official regulations and technical prescriptions. For example, the General Specifications for the execution of private buildings, edited in 1970-1973, did not refer to glass, except for glass wool and other derived products. In the specifications edited by the National Direction of Telegraphy and Telephony (RTT) in 1958, there was a short paragraph on glass containing some recommendations and prescriptions, for instance on the thickness of the glass or the use of putty. Local building regulations contained usually very brief references to windows: for instance the 1948 building regulations of Ixelles (in force until 1975), prescribed the minimum area of windows in relation the floor surface, but contained no functional or other requirements. Also the already mentioned Technical Information Note 25 published by the BBRI in 1962 did not define quality or performance requirements. Finally in 1980, the Ministry of Traffic and Infrastructure edited Unified Technical Specifications STS 38 on glass and glazing. In 1989, these specifications served as the basis for the first norm on glass prepared by the Belgian Institute for Normalization, NBN S 23-002 (STS 38). In the meantime, the Commission of the European Community published prescriptions on the use of flat glass in buildings (Rapport EUR 8069, 1983). The lack of official norms and regulations for glass in the post-war period reflects a lack of attention to the question of what properties needed to be regulated or standardized. Glass seldom fulfilled a structural function, at least in post-war housing. For safety glass (used for doors and parapets among other things), certain mechanical properties were very important, yet these still were not regulated by 1975. And while the thermal and acoustical insulation properties of glass became increasingly important during the post-war period, no specific requirements were formulated: when in 1974 the first Belgian norm on thermal insulation was issued, it proposed a maximum heat transmission index T for each room without specifying the performance of individual materials or surfaces. Other properties required of glass in private housing, such as transparency, color, reflection, etc., were usually specified by architects, who could freely choose among the various types of glass the ones that came close to their design intentions. One instrument that could guide the architect or client was the rating classification for mirror glass and window glass, from AA (for mirrors of superior quality), A (for special applications), B (common applications), to C (industrial applications). Despite the lack of any official prescriptions, manufacturers often had independent laboratories perform tests on their products in order to objectively verify certain characteristics (e.g. durability and resistance to chemical agents) and to be able to use the results in marketing. In contrast to the absence of glass and glazing in official norms and regulations was the great attention to glass in the architectural press. Of the technical and documentary articles (excluding articles on case studies) that covered one or more of the eight post-war building materials treated in this research, the great majority dealt with glass – specifically, about one third of some 75 articles. 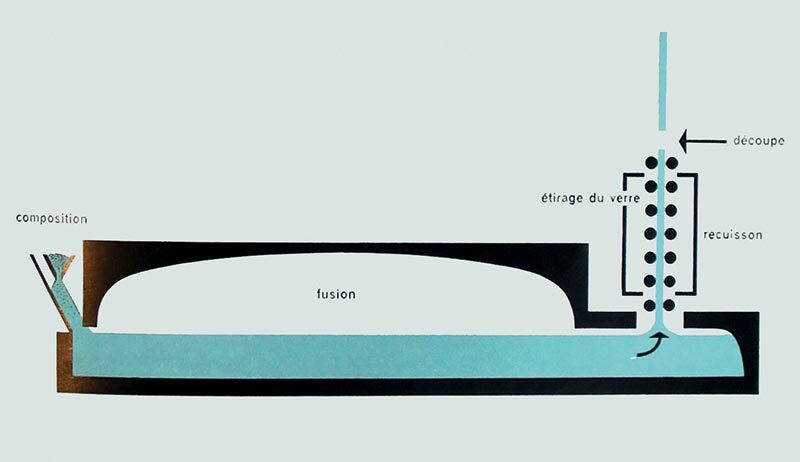 Many of these appeared in two themed issues on glass and glazing, in Architecture and La Maison (Architecture, n° 30-31, 1959 and La Maison, n° 7, 1959). Some of these articles were rather commercial writings disguised as documentation. The editorial board of Architecture had relied heavily on companies and federations of the Belgian glass industry to provide content for the special issue. Pierre Gilard, director of the National Glass Institute, who wrote the editorial comment, declared that glass had become one of the most significant materials in contemporary architecture: “Le verre ne constitue plus, comme par le passé, un simple moyen d’obturation laissant à la pierre la faveur de créer un style, il prend rang parmi les éléments fondamentaux de l’architecture”. Pierre-Louis Flouqet, in his preface to the special issue of La Maison, praised the ‘matériau de lumière’ even more: « L’évolution de la civilisation, si l’on y songe, résulte pour une très large part de l’amélioration de la fabrication du verre ». The glass industry was indeed very active in publishing and producing commercial documentation. 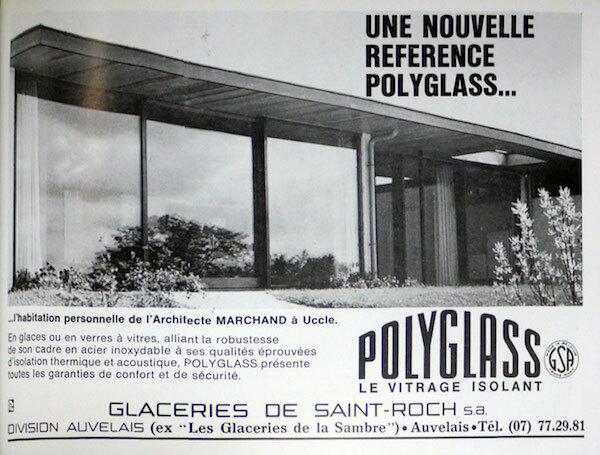 Over 900 advertisements in Architecture and La Maison that dealt with the eight materials in this study were analyzed; of these, almost 300 treated glass and glazing. Likewise, of the almost 500 relevant contemporary company catalogues and brochures found in architectural archives, 30% dealt with glass products. The next most common products in the advertisements and company catalogues were cladding and sandwich panels, as well as window frames. Glass was, without exception, used in every house constructed in the post-war period in Brussels. Yet, it was relatively infrequently mentioned in descriptions of new houses in the architectural press. The particular kind of glass used in a project was mentioned in only approximately 25% of the journal articles that discuss the materials and construction techniques. Although the sample of approximately 40 cases may not be completely representative, it does reveal some trends. In one fourth of the cases, glass blocks or glass mosaics were used. 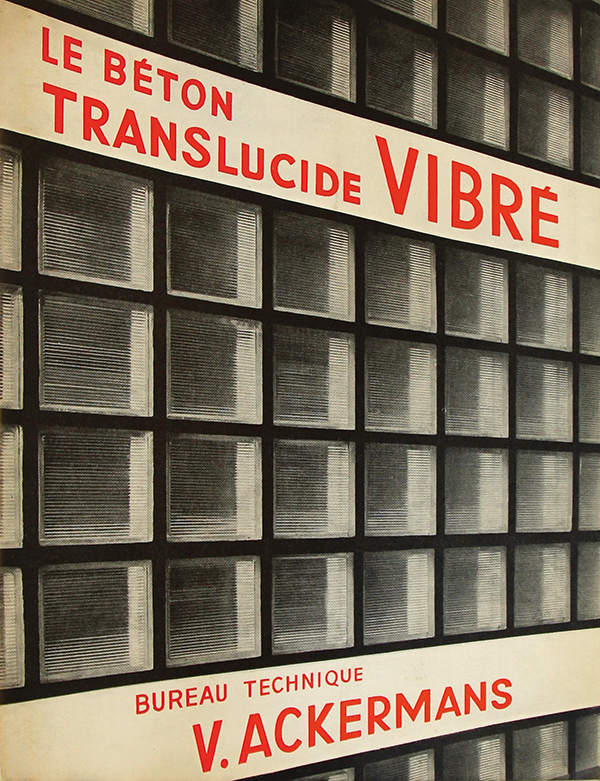 Glass blocks were used for small architectural details, multicolored decorative works of art, large strips in façades, and entire walls in ‘béton translucide’. Glass was also used in mosaics, for example to cover a concrete façade or as wall finishing in ‘wet’ rooms. Safety glass was used in approximately 25% of the cases, mostly for doors and balconies. Securit was very popular for both front doors and parapets of balconies and stairs; Clarit too was used for interior doors, parapets of balconies, and for partition walls. In a few cases, coloured safety glass was used for parapets of balconies, e.g. ‘smoked’ tempered triplex glass, double laminated glass in a light grey tint, and bronzed tempered glass. More significant for building technology than glass blocks or safety glass, which were often used for decorative details or freestanding elements, was the use of double glazing. This was mentioned in almost half of the glass case studies. 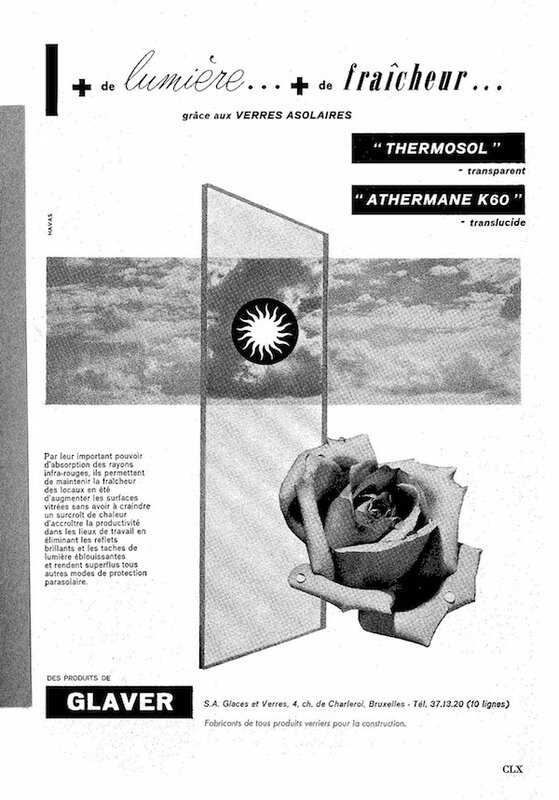 Thermopane was the most popular (or most mentioned) brand, closely followed by Polyverbel, with Polyglass in third place. Double glazing was first mentioned in 1952 in a six-storey apartment building designed by Josse Franssen in 1950. Although the description literally says ‘double vitrage’, this was a very particular kind of double glazing: the space between the two glass panes was very wide, and the sliding shutters were fitted in between the two glass panes. 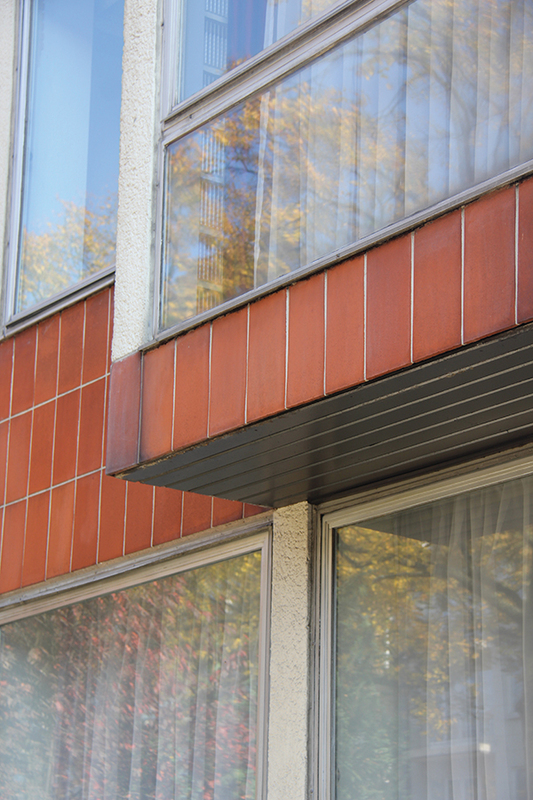 The first mention of genuine double glazing was in 1956: in this case Thermopane double glazing was used for an apartment building in Uccle, again by Josse Franssen. The architect had advised the individual owners to use Thermopane double glazing, after which the majority of them followed his advice. Double glazing was used in every type of construction, from traditional masonry, to concrete skeletons, to timber frame constructions. Yet, it was a rather ‘exclusive’ or luxury article initially. In a number of cases, double glazing was not used throughout the building but only in the living areas or the rooms with unfavorable orientations. 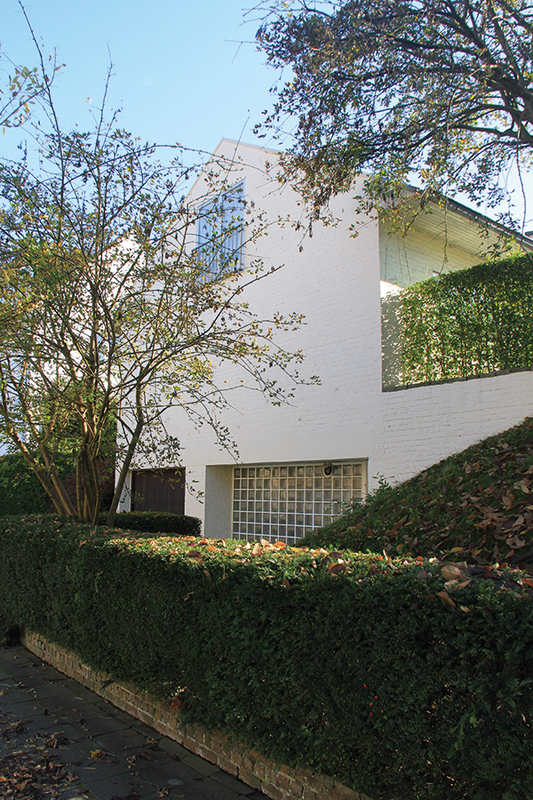 An idea of the cost of double glazing can be obtained from an article about a single-storey villa in Uccle, designed by architect Marc Marchand and published in La Maison in 1968. The total cost of the house amounted to 2 million old Belgian francs, of which approximately 3% was spent on glass and glazing; by comparison, the segments ‘electricity’ and ‘sanitary fittings’ were also roughly 3%. It seems that the high price of double-glazed windows was more of an obstacle to their use than the ‘newness’ of the technique and possible start-up problems. In only one case, in 1969, the article mentioned lab tests of a prototype, confirming the watertightness of a double-glazed window with a wooden frame. 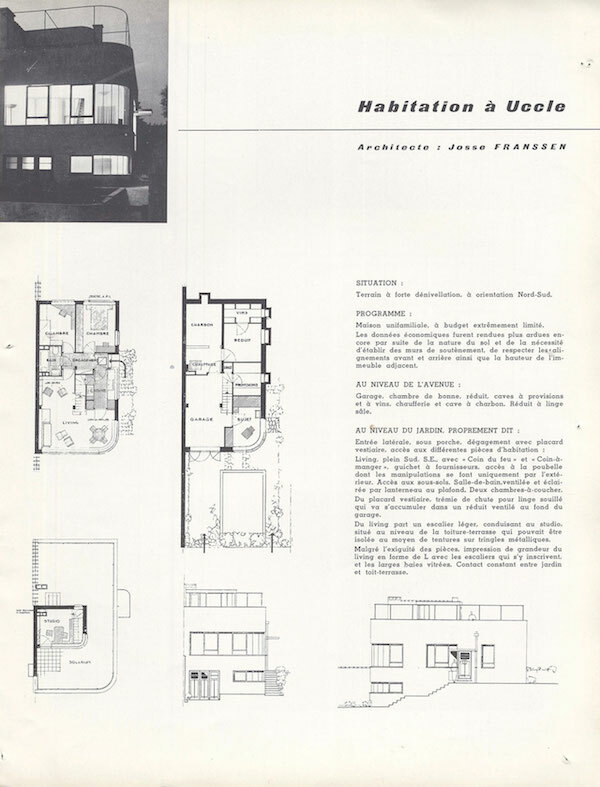 A few other types of glass were mentioned in articles about houses published in the post-war journals, including simple drawn glass (both Univerbel and L.O.B. window glass), insulating glass (although it is not clear if double glazing or actual insulation glass was meant), cast glass, and enameled glass Colorbel. Also Marbrite glass was used in two projects designed by architect Willy Van Der Meeren. In his Ieder Zijn Huis apartment building in Evere, he not only used concrete façade panels with a polystyrene core and Thermopane glazing, but also large sandwich panels in wooden frames, made of layers of Marbrite, polystyrene, and plywood. A few years later, Van Der Meeren again used sandwich panels that included Marbrite for a corner house with a lawyer’s office in Etterbeek. Go to the image archive or Read "prefab floor systems"